You’ve been asking since I started posted our homemade sourdough bread in December and finally I’m going to share a recipe! We made Veggie Sandwiches on Homemade Mini Sourdough Boules this weekend, they were amazing, and I got so many requests for the Homemade Mini Sourdough Boules. I started the dough on Friday mid day, fed it before heading to bed Friday night, and went to make the dough Saturday morning but my husband beat me to it. He made the dough and we let it rise before shaping and I left to run to the market and do some errands. I told him I wanted buns and I got home early that afternoon to the amazing smell of sourdough baking, him watching the Wild Playoff Game, and baking Homemade Mini Sourdough Boules minutes away from being done. They were so perfect! You really can’t beat the light airy texture of fresh sourdough, the chewiness, the sour taste, and it’s hard crisp crust. For dinner we all had sandwiches or burgers and I toasted one up and stuffed it with all the veggies and it hit the spot! 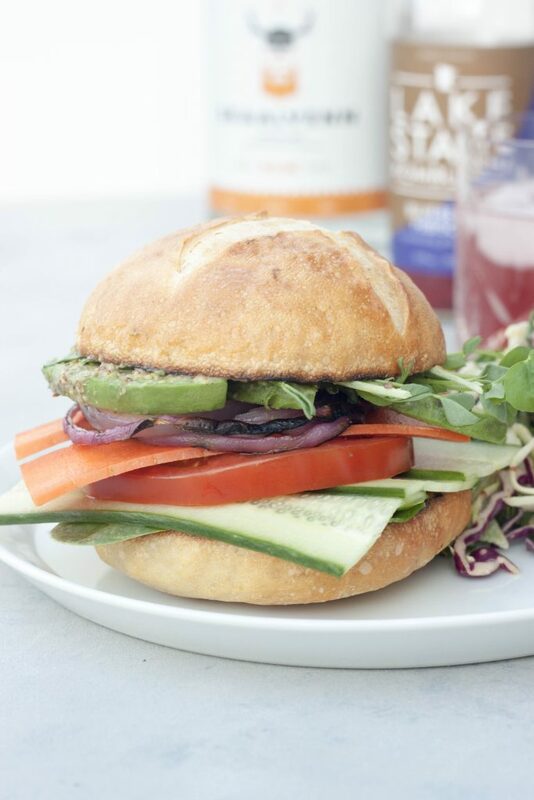 Of course you can make your sandwich however you want but I will include the “recipe” for my Veggie Sandwich below with the recipe you all want for the Homemade Mini Sourdough Boules! If you follow me on Instagram we started making sourdough back in December and I thought we would just make it for the holidays. I didn’t to have my gluten sensitive tummy to handle it so well as we weren’t making it with our usual gluten free flour. I had more, and more, and more just waiting for my body to say enough it enough woman but that still hasn’t happened so I’ve been enjoying every bite and second of it. I even posted a couple weeks after Christmas that I’d had so much bread in just a couple weeks that it was more then I had consumed in years. While it might not be a big deal to some it has been life changing for me and I’m loving the simple things and toast has become a go to for so many crazy nights for a quick dinner. Of course topped with so many things and basically open-faced sandwiches or bruschetta. I also had French toast for the first time in so long and I loved every bite. While I’m not saying this is for everyone with a gluten sensitivity it works for me. We’ve done a lot of research on sourdough but I always encourage people to do their own. This is a very useful post https://www.culturedfoodlife.com/can-sourdough-change-the-gluten-free-diet/ in which I could relate to as sprouted bread was one that I could handle, and didn’t have it often as it wasn’t the same as bread I grew up loving and really wanted. You can of course try this with your usual gluten free flour but I can’t vouch for the results. We make at least a batch every week. We have a routine pretty much and will either pull our starter from the refrigerator Thursday night if we want to have fresh sourdough Saturday morning or Friday morning or mid day if we want it Saturday afternoon. We do change this up sometimes based on schedule, and sometimes my husband gets up in the middle of the night to bake it so it’s ready for breakfast. We also go a little crazy sometimes and make a double batch with all these plans but we really need to just keep it to 1 batch and if we run out or need more make another because it’s really best fresh. We do have 2 loaves in the freezer right now but we haven’t pulled them out to test how that works yet. With OUR typical batch we make 3 loaves or bread, or 2 loaves and some smaller boules or French loaves, or in this case we made 2 loaves of bread (large French loaves this time and not in our standard pan) and 6 of these mini boules. Last weekend for Easter we did a loaf of Cinnamon Swirl Sourdough, plain, and I made the Raspberry Swirl Sourdough Knots. Once you make the regular sourdough then the fun comes with playing and adding in things. Or in our case our first loaves were plain boules and ones we added activated charcoal to for loaves of coal for those who didn’t behave (a joke if you got the naughty or nice bread). My husband also made jumbo sourdough English muffins. We can get to that later, if there are requests for more sourdough recipes. Many wonder how hard sourdough is to make, not hard but it isn’t quick. It isn’t a lot of hands on time but a lot of waiting. There is variation and you will find what works best for you, your area (it harvests yeast in the air so it may vary depending on where you are), and your tastes (the longer you let it proof the more sour taste it will have). It will require a kitchen scale, sourdough starter (you can make your own or buy it), and a glass jar with a tight lid to store your starter. For these Mini Boules and Boules in general it will also require a baking stone and a way to inject steam into your oven. We had everything, including a baking stone which we got for our wedding over 15 years ago and that we use all the time for bread and our homemade pizzas. For steam we use an old heavy rimmed baking sheet and have it piled with river rock (which was washed when we purchased it) and use a large pastry icing plastic squeeze bottle with water. Another option for making sourdough without the baking stone and rocks would be to use a Dutch oven but you are limited in what you can make. A Kitchen Aid also makes it easier but it’s do able without. Trust me when I say I use to never make bread because it wouldn’t turn out. My husband got a bread machine for a wedding shower gift with his name on the tag. We didn’t use it much only a few times, he used it again when I was diagnosed with Celiac (years later told I don’t have it), and haven’t used it since. I made the sourdough for the girls and me when the hubby was traveling in February because we “couldn’t live without it” and hey it was so easy I started making it. So he moved on to homemade pasta, but really we both still make bread because we really enjoy the whole process. I really can’t explain it but as “complex” as it may seem it’s simple and the process is relaxing and there is just this calm about the whole process. Watching the dough, the smell of it baking, and this crackle you hear as the fresh out of the oven bread cools. I can’t even tell you the last time I bought bread. Probably October and we still have it in the freezer as that is where I always stored an extra loaf of sprouted bread we use to buy. If you’re still with me, trust me you won’t regret diving into making your own sourdough bread. We enjoy it so much as I said and like playing so if there is something else you want to see, want us to try, or another bread we make that you want me to share the recipe for let me know! I have a feeling I’ll be posing our Cinnamon or Cinnamon Raisin Swirl Sourdough soon since I get so many requests for that. I’ve been meaning to post it but really wanted to go in depth but after the response and messages about the Veggie Sandwiches on Homemade Mini Sourdough Boules I (we because my hubby had to write up the bread process since he’s good at it and processes) had to pull an “all nighter” to get this posted today. I really hope you enjoy them as much as we do! 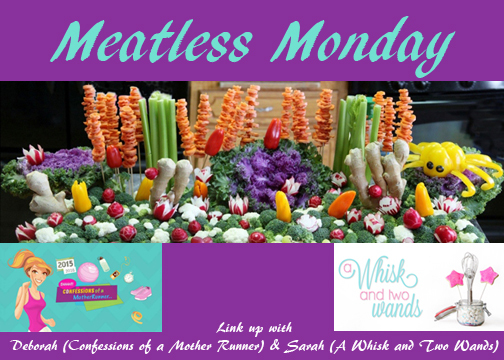 It’s also Monday so of course my co-host Deborah and I also have our Meatless Monday link up below. 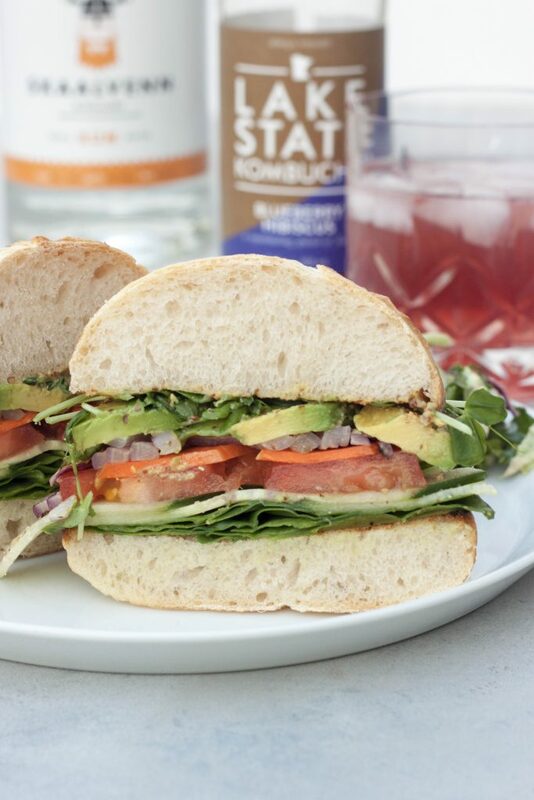 If this Veggie Sandwiches on Homemade Mini Sourdough Boules recipe, or sourdough in general since you can make what you want, hasn’t inspired you I hope you are inspired by one of the many wonderful recipes below! Slice cucumber and carrot length wise in thin slices, I use a mandolin for this. In a shallow dish soak cucumber in vinegar. Slice onion into 1/4″ slices. Pre heat grill. Slice tomato slices. Place onions on the grill for a couple minutes on each side over medium heat. In the meantime slice your Mini Sourdough Boule in half. Toast boule, cut side down, until lightly toasted. Slice avocado. Top toasted bun with spinach, cucumber, tomato, carrot, grilled onion, avocado slices, pea shouts. Spread spicy brown mustard on the inside of the top bun. Enjoy! Pull about 150g of starter from the fridge and place into a large container that has a lid (we use an ice cream pail). Feed starter equal parts by weight of flour and room temperature water to have approximately 450g of starter. Place cover on container and let sit in a warm location for 12 hours. Feed equal parts by weight flour and temperature water again to have approximately 1350g of starter. Place cover on container and let sit in a warm location for 9-12 hours. Starter should be quite bubbly now. At this point remove 50g of starter to live for another loaf , feed equal parts flour and water, then place in the refrigerator in a glass jar with an airtight lid (this is where you get the 150g you start with for the next batch). Place the Kitchen-Aid mixer bowl on the scale and tare it. Add the starter to the mixer bowl, take note of the weight, then tare the scale. Add 4 parts flour for every 7 parts starter by weight. Hint: Multiply the starter weight by 0.5714 and that will give you the amount of flour to add. Add about 2 TBSP of salt. This doesn’t have to be precise but should be close. Start mixer on lowest setting then add a small amount of water at a time. Do this about 5-10 seconds apart and keep adding water little by little until dough comes together. Turn mixer up one more speed (2 on our Kitchen-Aid) and let mix about 10 minutes until dough looks smooth. Dough should be extremely pliable and pass the “window pane” test where a piece of dough can be stretched where light can pass through it without breaking. 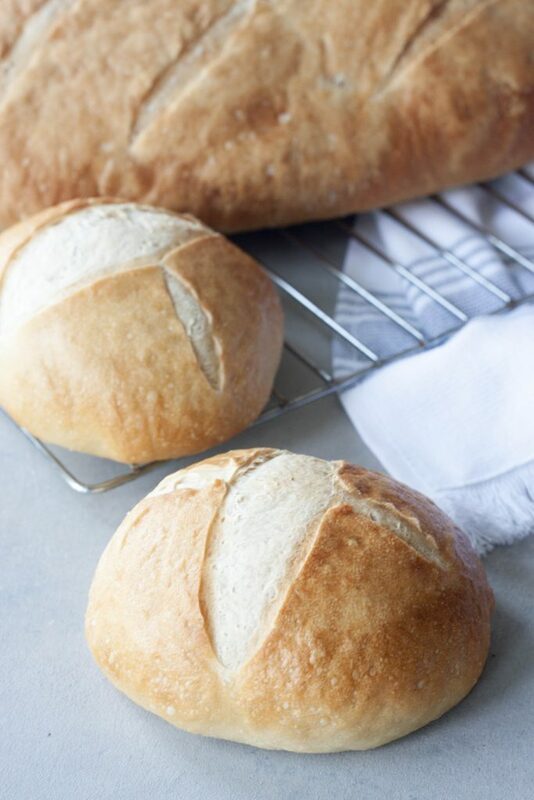 Place a damp bread towel in a large bowl and move the dough to the bowl. Cover the dough with the extra from the towel and place plastic or a cover over it to keep things from drying out. Let sit and proof for 4 hours in a warm area. Remove dough from the bowl and divide into 18 equal parts. Shape each part into a flat disc about 3″ across, place on parchment paper approximately an inch apart, cover with a damp bread towel, place a sheet pf plastic wrap on top of the towel, and let sit and rise for 2-3 more hours in a warm location. 1 hour before baking preheat oven at 400 degrees F.
Just before baking, score top of dough with relief marks using a sharp knife to assist in rising. Slide boules, keeping them on the parchment paper, directly on baking stone and quickly squirt water on the rocks to generate steam and close the door. Bake for 30 -45 minutes until golden brown. Let cool for a minimum of 1 hour before cutting. That sour dough is serious!!! I bake every once in a while but I don’t think I could ever get my bread to look as beautiful as that! Thank you Annmarie, I can’t imagine a week without it now. Well I can since I didn’t for a couple weeks in March when I was sick and then traveling but it was one of the first things made when we returned home. These are so beautiful and I bet the fresh sourdough MAKES them! I’m not going to lie I could have just had the bread with olive oil, butter, or avocado and been just as happy. If you’re every in Minnesota I’ll make sure you get a fresh loaf. Now that’s what I call a sandwich! Bring on the veggies! And that sourdough looks amazing! I’m not going to lie it’s hard to beat fresh sourdough. This is life!!! I have been waiting for this beauty to show it’s face! I am so proud of your baller skills in the bakery department, I need to take note! I hope you give it a try, it really isn’t hard and if you have any questions I’m here! These sound SO good! 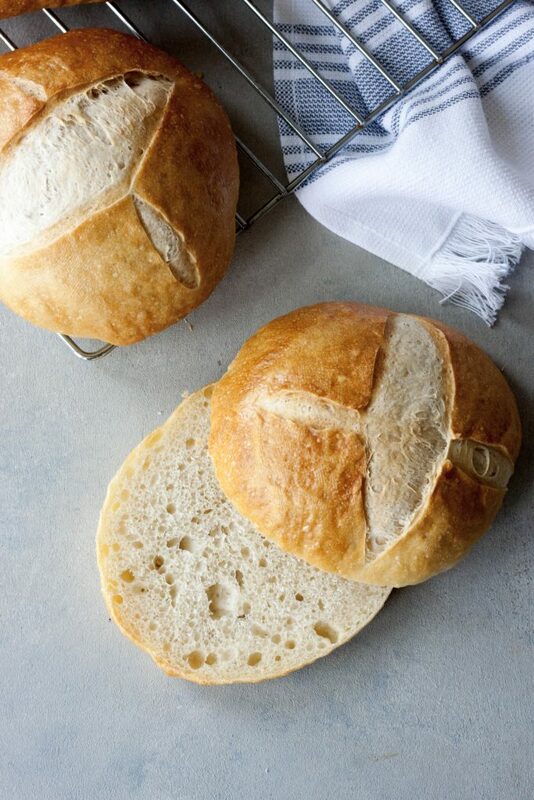 Can’t go wrong with homemade bread! You really can’t which is why it seems we’re always making it. What a gorgeous homemade bread! 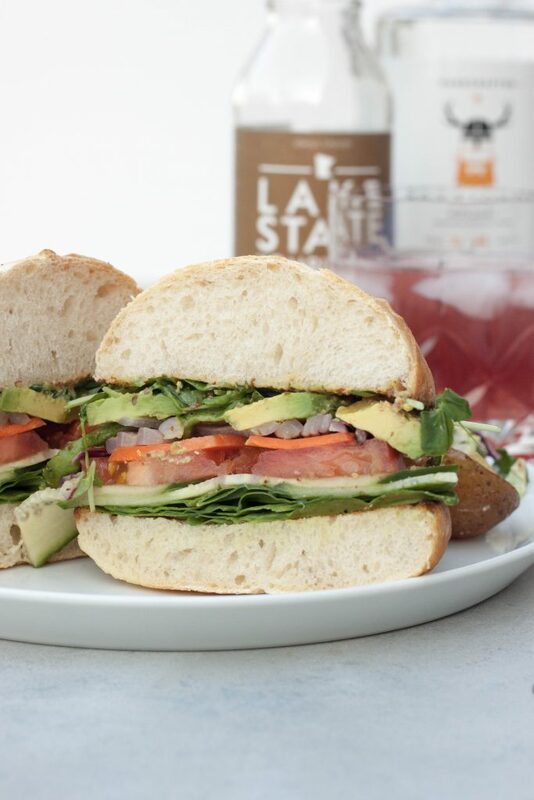 This veggie sandwich looks like a great lunch! Great way to get in more veggies! 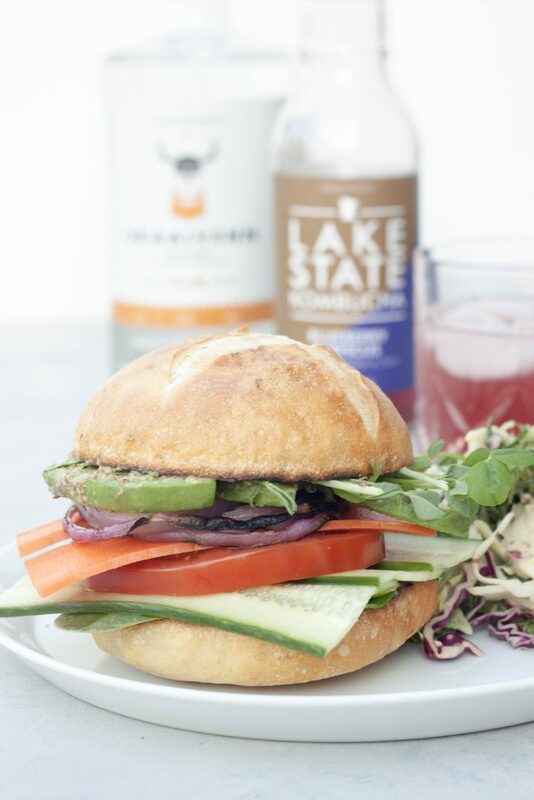 What a delicious veggie sandwich! Looks amazing and so full of nutrition!! Thank you, I packed in as much as I could and even debated more but wanted to makes sure I could still take a bite. Yay! I’ve been totally drooling over this on Instagram. The sourdough boules! I saw you post about your husband writing this recipe up and was so excited to see it. I’ve never ventured sourdough, as I only recently developed a taste for it. I think it’s time for a baking adventure! And I love those veggie stacks! Homemade bread is one thing that I’ve always wanted to try and I just never do. These rolls look super good! And I love a loaded veggie sandwich! Loved the recipe! Great idea to consume homemade food at work! Agness of Run Agness Run recently posted…Solo or Social? Should You Run Alone or Find a Pack?